Motorcycles represent freedom and the open road in America, and offer a unique perspective of touring the country if a person is so inclined. For all the strictures of society a motorcycle metaphorically shrugs off, they unfortunately also expose riders to a high risk of serious injury in case of an accident. 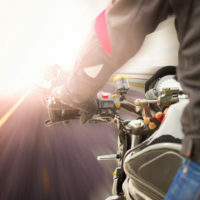 Motorcycle accidents rarely result in significant injury for the occupants in a car or truck, but can be deadly or permanently disabling for a motorcycle rider. While fairness dictates the driver of the vehicle is at fault for an accident, the reality is not so simple. All drivers on the road, including motorcyclists, have a responsibility and legal duty to operate their vehicle and bike prudently and reasonably to reduce the likelihood of an accident. When a driver deviates from this standard and an accident occurs, the law says he/she may be liable for any injuries that result. Many people have a negative bias against motorcyclists as irresponsible daredevils, which can complicate convincing a jury or judge the cyclist does not hold most or all of the fault. However, a personal injury attorney experienced in motorcycle accidents can overcome these prejudices, and help motorcycle accident victims get the compensation they deserve. A jury recently awarded a motorcyclist injured in an accident by a vehicle reversing at a stop sign in South Florida over $375,000 in damages. A discussion of issues that are common in motorcycle accident personal injury cases will follow below. Studies have shown that wearing a helmet reduces the likelihood of a head injury for a cyclist in an accident. A rider’s compliance with state helmet laws can affect his/her ability to recover in an accident, including the types of injuries suffered. Florida does have a helmet law that requires all riders under the age of 21 to wear a helmet while operating a bike. However, it excuses riders over the age of 21 from wearing a helmet if they have an insurance policy with at least $10,000 in medical benefits for accidents. Thus, riders over 21 can opt to not wear a helmet, but even though helmets are not required, if a head or neck injury occurs when a rider was not wearing one, judges and juries are likely to view this as at least partially the fault of the rider, which reduces damages according to the amount of fault attributed to the motorcyclist. This is due to the well-documented connection between helmet use and head injury prevention. If no head injury occurred, the presence or absence of a helmet is irrelevant. Lane-splitting, or riding between cars stopped or slowed in traffic, is a common method of driving for motorcyclists. However, only one state, California, recognizes this maneuver as legal. In Florida, lane-splitting is illegal, and commonly results in the motorcyclist bearing all the fault for an accident. However, if there is evidence another driver contributed to the accident, it may be possible to recover some compensation for injuries suffered. Judges and juries tend to view this behavior as reckless, so having an experienced personal injury attorney to argue that one unfortunate mistake does not automatically translate into complete responsibility for an accident is essential to obtaining compensation for an injured party. Being injured in an accident can permanently change a person’s life, and accident victims should not be forced to suffer such injuries alone or in silence. Talk to an experienced motorcycle accident personal injury attorney about the possibility of filing a claim to recover for your injuries, money you and your family needs to help heal from this experience. The Miami law firm of Pita Weber Del Prado knows how to convince juries about the need to hold irresponsible drivers accountable when they cause an accident, and is available to evaluate the facts of your case. Contact us for a free consultation.